LOS ANGELES (March 18, 2019) —Undefeated super lightweight Arnold Barboza Jr. is a young contender closing in on a world title shot. Mike Alvarado wants another taste of world championship glory. 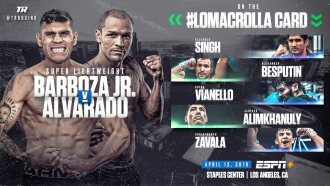 Barboza, from South El Monte, California, will take on former 140-pound world champion Alvarado in a 10-round super lightweight bout on Friday, April 12 at Staples Center as part of the Vasiliy Lomachenko-Anthony Crolla undercard.